Taiga is back at school and apparently her old self, which pleases Yuusaku and Ryuuji. Yuri-sensei summons Taiga and Ryuuji to the teacher’s room regarding their career assessments. Being rich, Taiga sees no need to fill it out and Ryuuji just hasn’t made up his mind. When Yuri-sensei leaves, Taiga makes a paper airplane of her assessment paper and tosses it out the window. Ryuuji doesn’t like that and this leads to a conversation where Taiga says she wants a normal life to meet someone normally and then fall in love with them in a normal way. 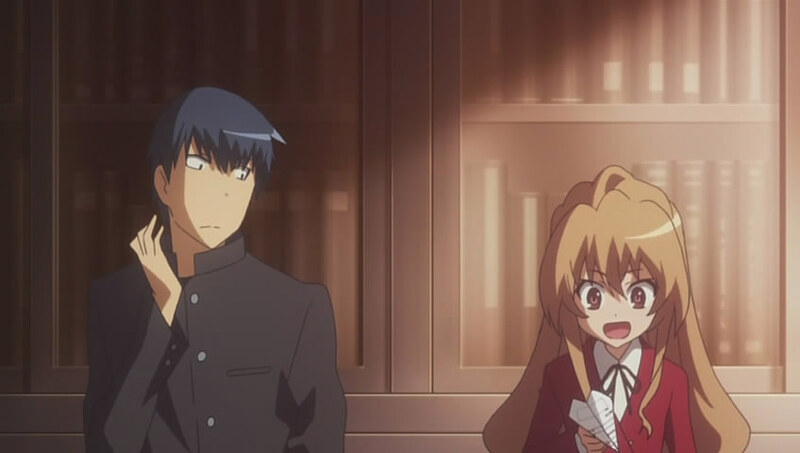 However, since Taiga is not a normal person and her life not normal, she doesn’t see that happening. 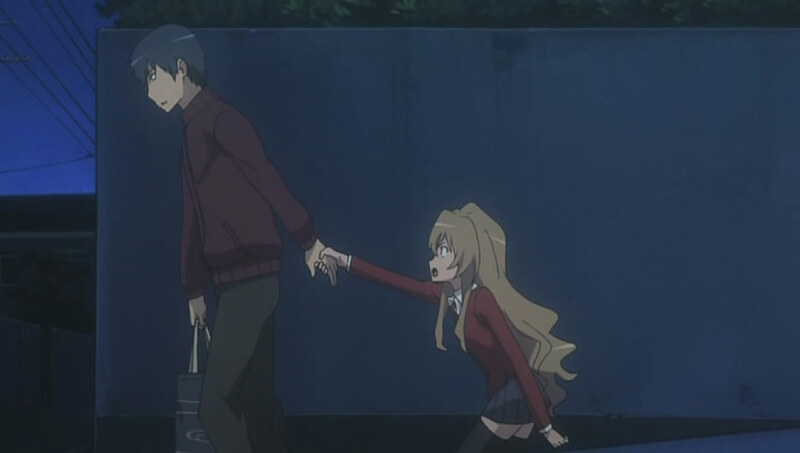 Ryuuji gets a bit frustrated by this and lets Taiga know, so Taiga leaves. Ryuuji decides he’s not going to college and will just get a job. He returns to the teacher’s room where he finds one of the teachers trying to get Ami to do something. Ami refuses and seeing Ryuuji, she’s going to leave. The teacher tells Ryuuji to follow Ami, so he does. At the shoe lockers, Ami accidentally drops one of her outdoor shoes, so Ryuuji picks it up. When Ami gets snarky about it, asking if he has a shoe fetish, Ryuuji throws the show outside as far as he can. 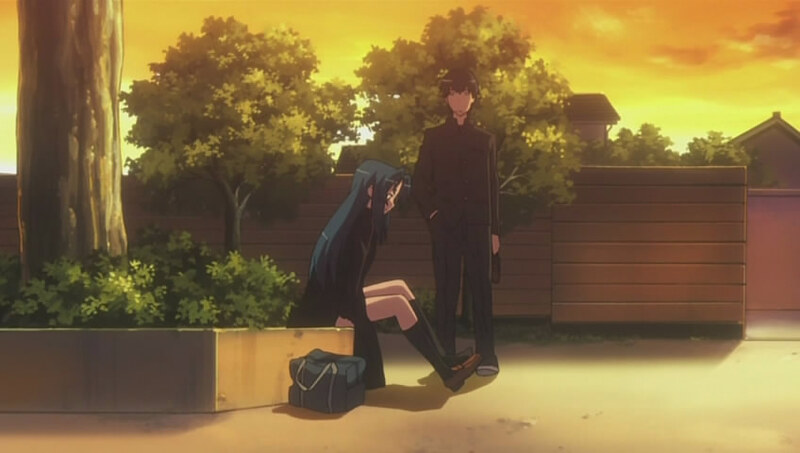 He eventually retrieves it as Ami waits, seated outside. He refuses to give the shoe back and asks what the teacher wanted her to do. The school wants her to model the school uniform for a pamphlet but she’s not going to do it. Ryuuji can’t understand why and Ami is annoyed. When she fails to retrieve the shoe, she says that she had initially planned to leave after the first semester when the stalker issue was resolved but changed her mind. One of the reasons was her friendship with Ryuuji, Yuusaku, Minori, and Taiga, but she also felt a kinship with Taiga and wanted to help her. Now, Ami feels that things will resolve themselves if she leaves. Ami snags her shoe and leaves but before Ryuuji can chase her, he gets a call from Taiga. Coming home, Ryuuji finds his mother is ill and cannot work either of her jobs. Ryuuji is angry with himself for not being more of a support for his mother. As such, he leaves to go pick up some things at the store but leaves his jacket, bag, wallet, and key so Taiga follows him to give it to him. Ryuuji’s state of mind leaves him upset and he nearly gets run over by a car until Taiga grabs his hand. He tells her he doesn’t know what to do and she tells him things will be fine. 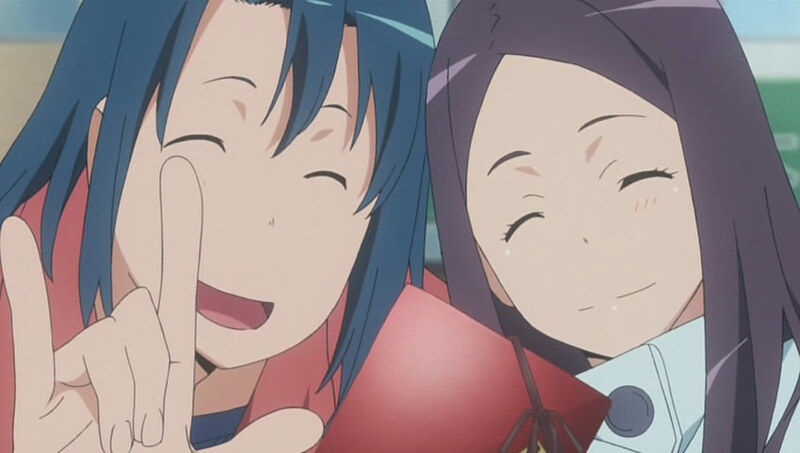 Together, the head to the cake shop where Ryuuji’s mother was working to sell Valentine chocolates and the two of them agree to work in her stead. The following day, they man the stand in front of the store and are surprised when Haruta comes up with a girlfriend to buy some chocolate. Noto stops by, which surprises Ryuuji. Noto asks if “Ami-chan” or “Nanako-sama” came by. Ryuuji tells him that Maya hasn’t come by which causes Noto to get all flustered, claiming to just be curious if Maya bought anything for Yuusaku. 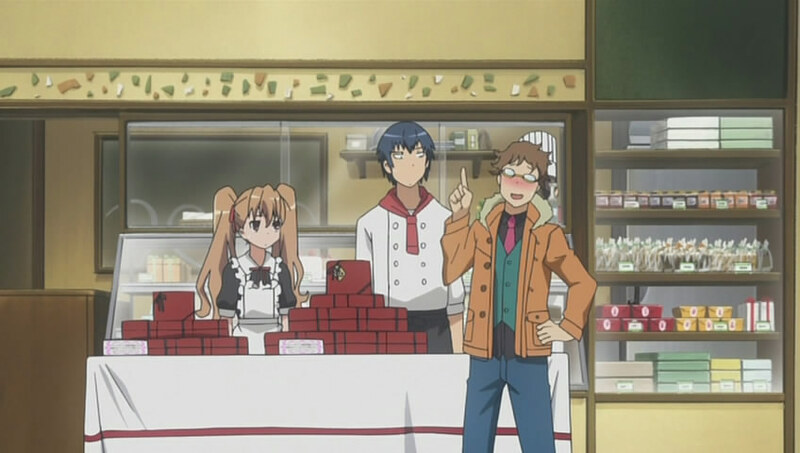 Taiga wonders what business is it of Noto’s what Maya buys, then realizes that Noto likes Maya and marvels that there really are people who discover they really like each other after fighting. Noto runs off and Taiga calls Ami for some sales support. Ami comes over but is not thrilled to see Ryuuji. 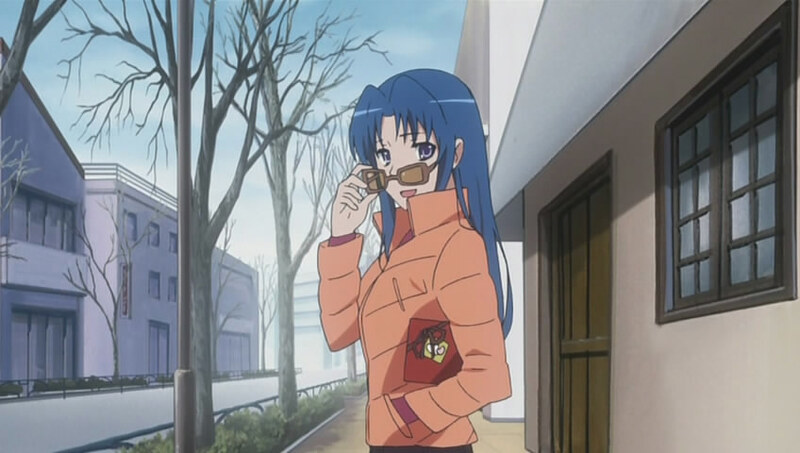 However, when people start recognizing Ami, she puts on her act briefly to generate sales. 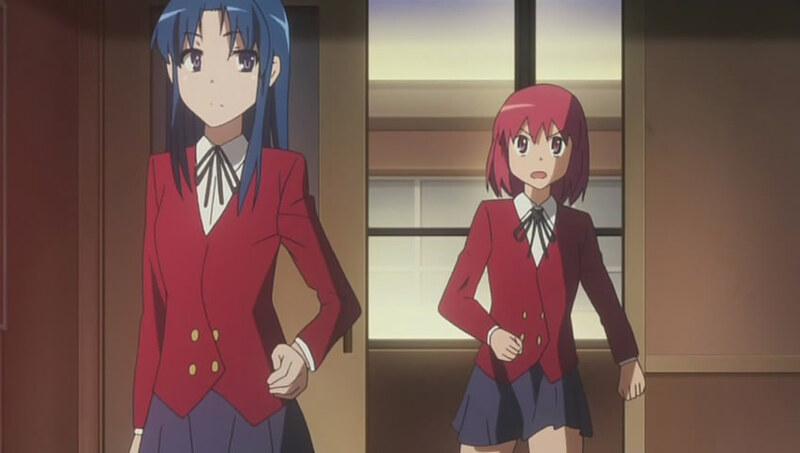 Ami leaves and Ryuuji follows her, leaving Taiga to handle all the business. Ami accuses Ryuuji of being like a stalker for following her and he counters by saying she likes to run away from things. Ryuuji tells her he wouldn’t like it if she left the school, nor would the others. 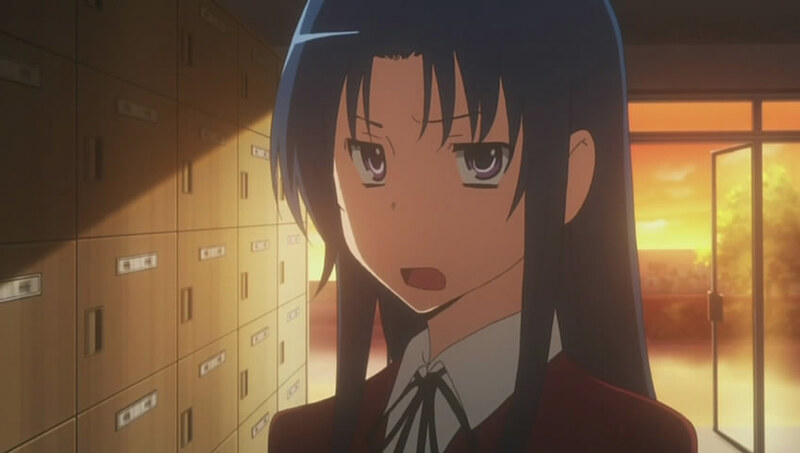 Ami sees that Ryuuji still doesn’t get it and so points out how Taiga is being overrun with business. 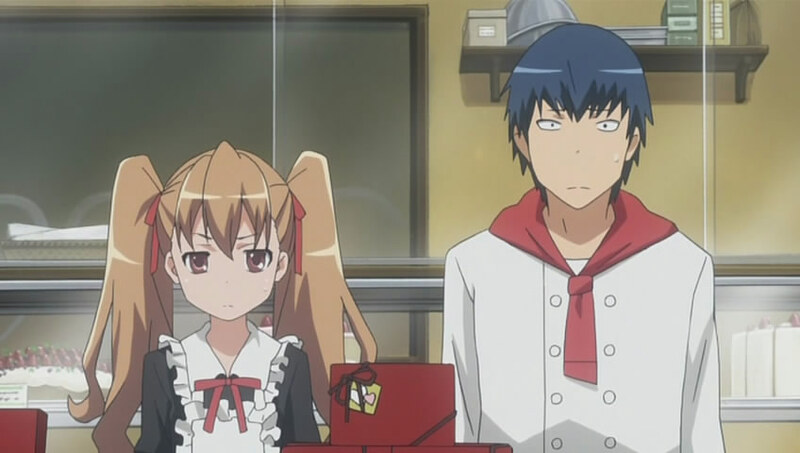 At the end of the day, they sold all the stuff they were supposed to sell but Taiga bough more chocolate just the same, planing to give it to everyone including Ryuuji if it would make him happy. He assures her it would. 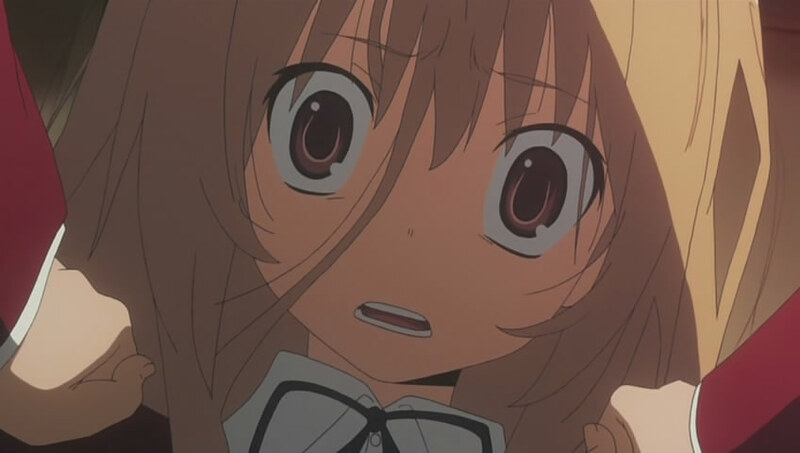 So Taiga makes chocolate and calls her four best friends together the next day after school to give them chocolate. She saves Yuusaku for last, saying his is special because he rescued her. 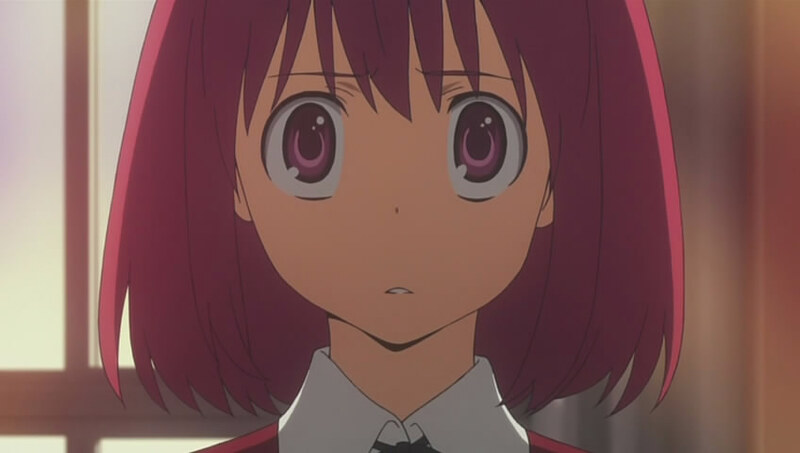 This causes a negative reaction from Minori, who is upset and angry with Ryuuji for lying to Taiga. Since Taiga is talking about how she could have said embarrassing things, Minori decides to bring the issue to a head. However, Taiga is embarrassed to say and Yuusaku is playing along with Ryuuji’s plan to keep Taiga in the dark about the truth. Minori has heard enough and goes over to Ryuuji, calling him a liar. 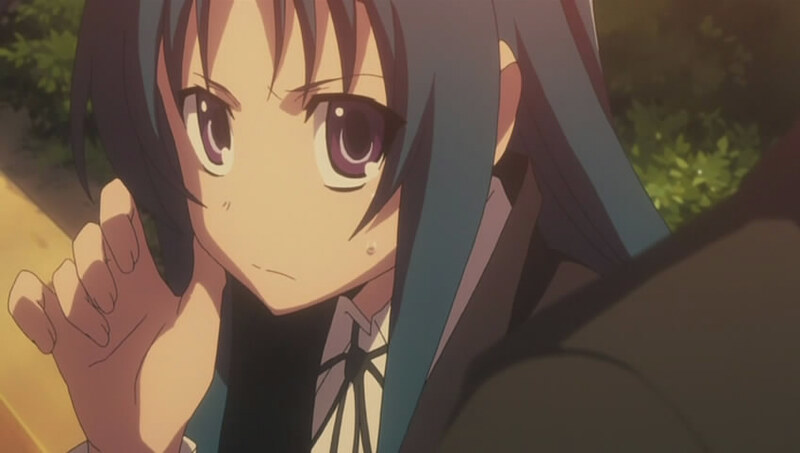 Minori is angry because Ryuuji thinks that by pretending not to know what Taiga said, everything will be OK. She’s also angry with Taiga for deluding herself. Minori tells Taiga the truth about what happened and demands to know why Taiga is hiding. Taiga manages to break free of Minori’s grasp but finds the back door of the classroom blocked by Yuusaku and the front door blocked by Ami. Minori goes for Taiga again, telling Taiga to trust her but Taiga is screaming to be set free, not wanting to face the truth. Taiga says she wanted Minori to be happy. Minori shouts that her happiness can only be her creation and not something that was created for her. Taiga again breaks free but this time Ami lets Taiga escape. Minori can’t believe Ami betrayed them, but Ami reveals her intent by saying that bad things will happen if Taiga isn’t pursued. She looks at Ryuuji as she says this, however Minori says she’ll be the one to go after Taiga since she’s not finished talking. In the meantime, Minori demands to know what Ryuuji is going to do. 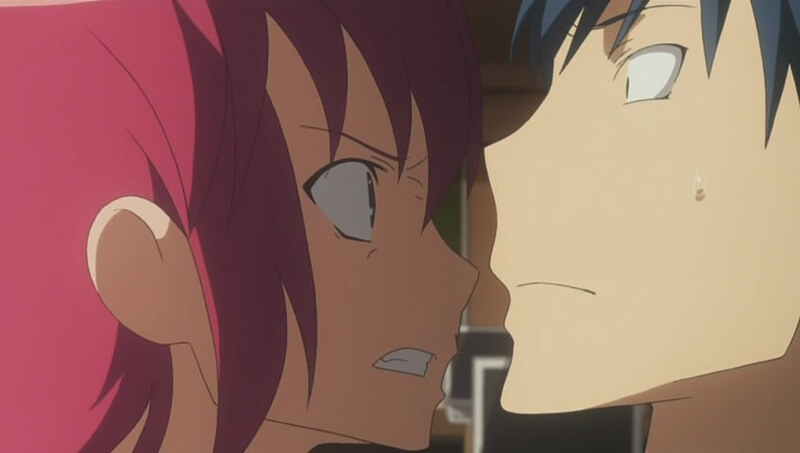 Ryuuji wonders what would happen if he chased after Taiga but he’s taking to long and Minori demands an answer now. I completely didn’t see Taiga and Ryuuji getting ambushed by Minori, Ami, and Yuusaku. Much like the summer home incident where Yuusaku played both sides, he pulls it off again. I can’t imagine that the plan went exactly as expected since Minori seemed really surprised, hurt, and VERY angry that Taiga didn’t know the truth about her rescue on the mountain. So I can only imagine that the three of them got together and were going to use the chocolate distribution from Taiga as a means of forcing a resolution to this messing love-thing going on between Ryuuji, Taiga, Minori, and Ami. The obvious theme of this episode is sacrificing what one wants to try to please someone else. It has been seen before and all the characters are guilty of doing it, much as many of us are in real life. The interesting thing here is that while Yuusaku, Minori, and Ami are trying to force Taiga to face the truth and her feelings for Ryuuji, aren’t Minori and Ami also sacrificing what they want for Taiga’s sake? 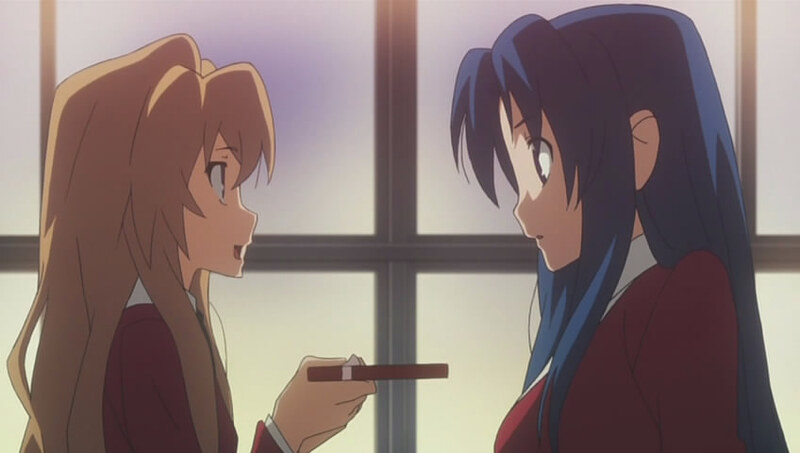 As I have long thought, Ami and Taiga are indeed friends (their duet at the Christmas party sealed the notion with me and I do like how the writers gave us double confirmation on that friendship from both parties) and despite herself, Ami is in love with Ryuuji. So why doesn’t she go for what she wants instead of putting Taiga’s (or Minori’s) happiness first? Minori is in love with Ryuuji and I have to think she knows Ami is as well in addition to her knowing Taiga’s feelings for Ryuuji. So why isn’t she going for what she wants? How can she lecture Taiga for doing the very same thing she’s doing? 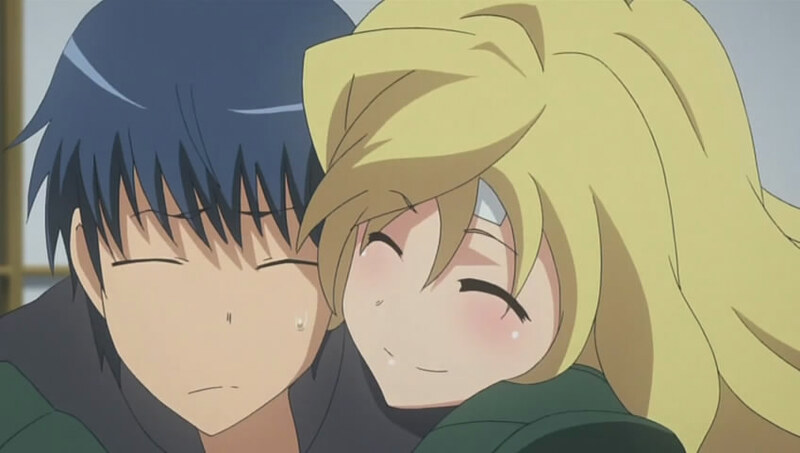 Ryuuji still comes off as mostly clueless about how Minori really feels about him and how Ami really feels about him. That said, Ryuuji came off better this episode than he has been. For starters, he showed he know all about Noto’s attraction to Maya despite Noto’s attempts to name-drop Ami and Nanako. When Ami got snippy with Ryuuji, he literally threw her shoe away, then wouldn’t give it back until he got some answers. He even chased her down, countered her with a “running away” jab, and told her he wouldn’t like her leaving the school. So I suppose in some ways, he’s finally starting to come around. I’m not sure if Taiga was being sarcastic or if she honestly didn’t figure out about Maya and Noto until she thought about Noto’s question about Maya. I tend to side with the sarcastic side and she made her remark to make Noto face the truth, which would be ironic considering her own situation. I had to smile at Taiga’s wish for a normal relationship accomplished in a normal way. Of course, that’s what she has with Ryuuji, or will have once Minori and Ryuuji chase her down. Didn’t know if you’d be interested, but Baka-Tsuki just finished translating a decently interesting side story about the girl who’s with with Haruta in this episode. And this one is translated pretty well compared to some of the main light novels.